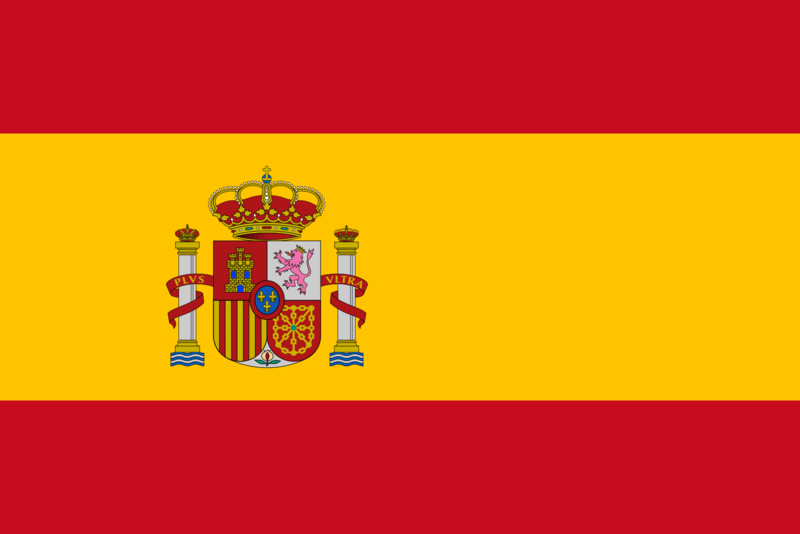 The current national flag of Spain has three horizontal stripes, where the top and bottom are red and the broadest central strip is yellow and in the upper left is the National Shield. It is necessary to understand the meaning of each of the parts that make up the flag of Spain. Since most of us know the parts, symbols and colors of a flag but many times we do not know their meanings. All the aspects that conform to the Spanish flag have much meaning and value in the life and culture of the Spaniards. The crown that is in the shield also is popularly known like “the timbre” and symbolizes the Spanish monarchy. The columns that have the motto “Plus Ultra” in Spanish means “Beyond” and in English “Further Beyond” and represent the columns of Hercules, peninsula near the Strait of Gibraltar . At the top of each column is a crown in each one and represent the historical past of the sacred Empire and kingdom of the country. The central part of the shield contains an image of the barracks and symbolizes the medieval kingdoms of Spain. The castle is the first quarter and symbolizes the kingdom of Castile. The rampant lion crowned is the kingdom of Leon, attractive place for the Romans and the bars of Aragon represent the crown of the province of Aragon. The chains represent the kingdom of Navarre. The pomegranate symbolizes the kingdom of Granada. The three fleur of in the center of the shield symbolize the arms of the branch of the Spanish dynasty, the Anjou of the House of Bourbon. The design of the Spanish flag has been changed many times, especially during times of Spanish expansionist policy in the centuries XVI and XVII. However, the red and yellow colors remained unchanged. Currently, the flag has three horizontal stripes, where the top and bottom are red and the wider central strip is yellow. In the upper left, is the national coat of arms? Its different parts represent Castile, Leon, Aragon, Navarre and Granada. The columns of Hercules on the sides of the coat of arms symbolize Gibraltar and Ceuta. The inscription “Plus Ultra” in a red ribbon wrapped around the columns has been used since the discovery of America and indicates that unlike the original belief, there is more land west of Gibraltar. The flag is formed by three horizontal stripes, red, yellow and red, being the yellow of double width that each of the red ones. The flag may incorporate the shield of Spain, but its incorporation is only obligatory in the cases provided for by regulation. The shield shall have a height of two-fifths of the width of the flag and shall appear on both sides of the flag in the center of the yellow stripe. When the flag has the normal proportion, of length equal to 3/2 of the width, the axis of the shield will be placed at a distance of the half-width sheath of the flag. If the length is less than normal or the flag has the square shape, the shield will be placed in the center. The eighteenth century saw the birth of the first regulations as to the types, numbers, dimensions, colors or symbols of the flags, which from that moment depended on the King. Until then flags and banners were particular of the captains, so they had different colors and divisions, sharing only the Blades of Burgundy – symbol that comes from the battle of Pavia, in 1525. The national flag of Spain has undergone some changes throughout its history. The rojigualda that we know today has its origin in the flag of the Navy and merchant of the time of Carlos III (1785), the first king in imposing a single model of flag, composed by three horizontal lists, yellow the central one -with A shield – and red the upper and lower. This initiative sought to solve the problem of equal flag warships. Then began to extend its use to fortifications, facilities. However, it is during the War of Independence that the linking of these colors to the popular feeling of belonging to the Spanish Nation, to its culture, religion or historical heritage is reinforced. The first national flag of Spain that represented to all Spain was the Cross of Burgundy that was used until 1793 and that was maintained like sign of the Spanish Empire until 1898. During the period of the Second Republic (1931-1939), the national flag had the colors red, yellow and violet, in three horizontal stripes of the same width. Under the dictatorship of General Franco, the flag lost its mauve color, which appeared on the flag of the Republic, and incorporated two very important symbols: the eagle and the coat of arms of the Catholic monarchy. In 1977, two years after Franco’s death, the eagle was slightly modified, and in 1981 it would disappear altogether, leaving the present red / yellow / red with the crowned shield. The new Spanish flag has three horizontal stripes of red, yellow (double width) and red, with the National Coat of Arms within the yellow strip. The shield includes the royal seal flanked by two crowned columns (the Columns of Hercules), with the inscription Plus Ultra.